Here’s some good cycling news. After spinning its wheels over a frivolous lawsuit, the city of San Francisco finally got an OK to move ahead with its bike plan, which calls for more bike lanes and bike amenities. One Rob Anderson, who calls himself a blogger, filed suit, claiming the city needed to file an environmental impact report before it could implement the bike plan. SFGate has the full report. Translation: he didn’t want to see more car parking taken out for the sake of bike lanes. Obviously, Rob doesn’t ride a bike. 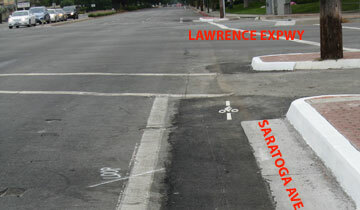 It’s a small matter, but in recent weeks the intersection at Saratoga Avenue and Lawrence Expressway in San Jose was widened about two feet. It was always a bit dodgy riding here because the road narrowed. Not only did the city (and county no doubt) take out some of the encroaching island, they added a bike symbol showing where cyclists should stop to trigger the light. Well done. This entry was posted on August 24, 2010 at 6:47 pm and is filed under News. You can follow any responses to this entry through the RSS 2.0 feed. You can leave a response, or trackback from your own site.